Paul and Karen would like to welcome you to The Old Rectory, a 17th century property which stands in an acre of garden, in the unspoilt rural hamlet of Llangattock-Lingoed nestling in the welsh border countryside. Located 6.5 miles from Abergavenny, the local market town. 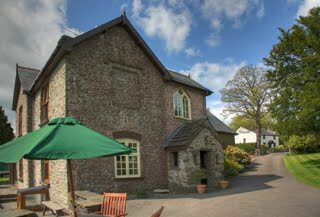 The panoramic views from The Old Rectory add to the charm, including the wild life and bird life. The famous Offas Dyke foot path passes the garden gate, a walk along the trail to the south will lead to White Castle which is one of the castles included in the Three Castles Walk. Head to the north along the Offas Dyke and the Black Mountain ranges await you which includes the enchanting Llanthony Priory. A drive over the Mountain from the priory along the Gospel Pass will lead to Hay on Wye, renowned for its many second hand book shops and Festival of Arts and Literature. The nearby market town of Abergavenny hosts one of the country’s top food festivals which is held in September. A drive through Abergavenny, the gate way to Wales, will lead to the breath taking views of the Brecon Beacons. Our local land mark, the Skirrid mountain is a pleasant climb with the summit offering views of Abergavenny, near by villages and the Black Mountains to the west. The 13th century Church of St Cadoc, adjacent to The Old Rectory has been completely restored, which makes for interesting viewing. We also have a public house in our hamlet along with many well known Restaurants in the area.